This particular cedar elm in Alamo heights was split all the way from the main union to the ground. The black line is the split. 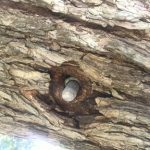 Tree bolt and cabling is a very familiar process with Canopy Tree Service in San Antonio Texas. Sometimes a perfectly healthy tree with no apparent problems will split and leave half of it standing, while the other half falls down. 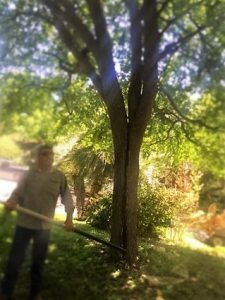 A majority of tree services will offer to remove the tree when there is sometimes the option to re-stand it, and bolt it back together. In some cases it actually can be done. 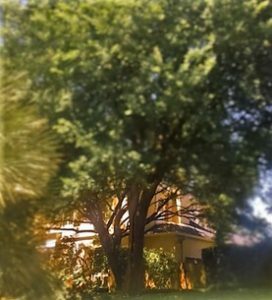 Certain trees in San Antonio take to bolting and cabling better than others. It has be observed that a cedar elm responds the best to this. There is also good success with oaks, mesquites, mulberries and hack berries. Ash trees do not appear to be as successful as the others. 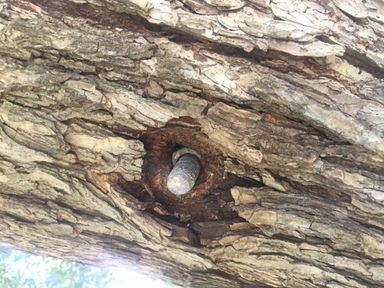 The best way to do this type of repair work is to run a series of bolts all the way through the tree. We then use a little wood glue in the middle, a nut and washer on both sides. The first bolt should be the highest and perpendicular to the split. It should not be drilled until the tree is in place. For the next two bolts drop down about the diameter of the tree between each bolt, and make an “X” beneath the first bolt. If more bolts are needed they should be spaced accordingly. The tree will eventually swallow the bolts as it increases in girth. Canopy Tree Service used a block and tackle rig with a truck to rest, and bolt this tree up. These pictures were taken in a follow up visit with Canopy Tree Service two years later.